Paget’s Disease, otherwise known as osteitis deformans is a metabolic bone disease. 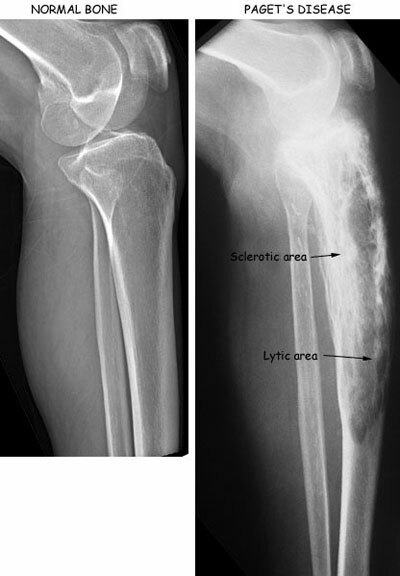 In this disease, the bones become destroyed and once it grows back, the patient will experience abnormalities. This disorder hampers daily activities. Should there be any broken bone, it will be replaced with a weaker one, and is more likely to break again. The deformities that the patient is going to experience could result in several difficulties and disturbance in normal living. Who Commonly Suffer From Paget’s Disease? Most elderly population (about more than 5%) in Australia, New Zealand and Europe experiences Paget’s Disease. As to why it is such, there is yet no reasonable explanation. However, there is still a considerable number of people outside the previously mentioned countries experiencing this disorder, particularly those from the population of the elderly. Although most patients do not experience symptoms, there are patients that might feel that their joints are stiff, and some of them could experience bone and joint pain, headaches, bowing of the bones in the leg area or bone deformity, neck pain, loss of hearing, fracture and noticeable reduction of the patient’s height. Until this recent time, the cause of the disease is yet unknown although there are speculations that this could be caused by any previous viral infections. It is also speculated that Paget’s disease could be acquired genetically. In the event of the bone destruction, there will be new one formed- one which is larger than the original and would be filled with blood vessels, thus there would be body deformities. As mentioned earlier, people suffering from Paget’s disease are mostly found in New Zealand, Australia and Europe. Thus, risk factors for this disorder could be regional. The disease causes bone tissues to breakdown, and the severity of this disease might also depend on the bone density of the person. More often, Paget’s disease affects a single part of the body. It could be the hip, the legs, the arm, pelvis, collarbone or spine. There are rare cases in which the skull is the one affected by the disease. This case is dangerous, because the deformity could affect hearing and even the normal functioning of the brain. Those who have developed the disease in the skull should be carefully attended to. Physical therapy should also be given, as there is a great chance that the patient’s mobility will become affected. There are also cases in which the bone breakdown happens once. In this case, treatment might not be needed. In most cases, Paget’s disease could be detected via X-ray or bone scan. The disease could also be determined if the patient has a high rate from the serum alkaline phosphatase test, or if the patient has any signs of bone breakdown. Biophosphonates or other medications that decrease the rate of the bone’s breakdown should be given to the patient. To name a few of these medications, there are: pamidronate, tiludronate, alendronate, etidronate, risedronate and many others. However, there are patients which do not respond well with biophosphonate medications, and so they should be given an alternative treatment.